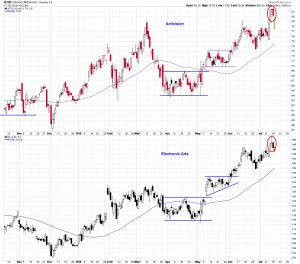 The price action in Electronic Arts (EA) is closely correlated to the price action in Activision Blizzard (ATVI), as would be expected with the two biggest names in the gaming industry. In trading on Monday shares of both companies were down and this large dark down-day candle completed the formation of a eveningstar pattern on their daily charts. This bearish pattern, as many know, is a three day reversal formation that consists of a large up-day candle, followed by a narrow opening and closing range “dpji” candle, and completed by a large down-day candle. It represents a transition in investor sentiment from bullish to bearishness, and often marks the completion of an uptrend. Activision and Electronic Arts both moved lower in early trading this morning but have since returned to roughly unchanged. The eveningstar pattern is invalidated after a close above the middle doji candle. There is no measured move downside price target associated with an eveningstar pattern. There are only conventional percentage retracement levels or areas of previous resistance-turned support. 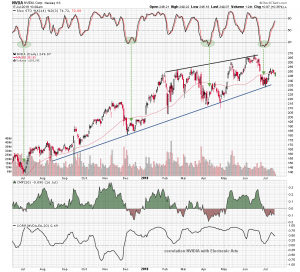 NVIDIA (NVDA) the big name in gaming chips has been losing momentum after previously testing an upside trend line. At the beginning of the month, shares bounced off the support line of a large rising triangle pattern as the stochastic oscillator moved out of an oversold condition. The stock has been unable to recapture its 50 day moving average and complete the second half of the return to triangle resistance. 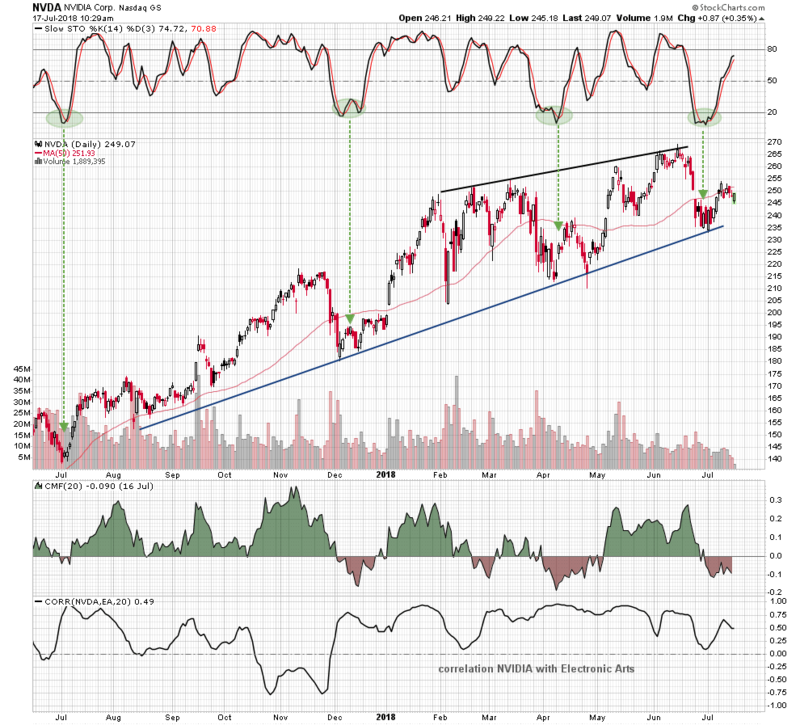 This is very similar to the price action after the April retest of the support line. 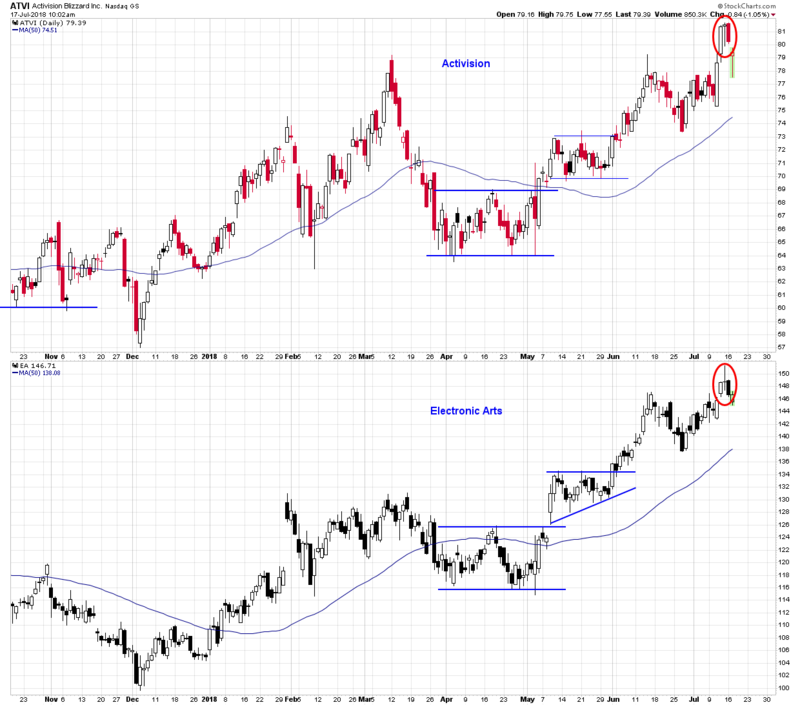 Price action in NVIDIA and Electronic Arts is closely correlated so if the bearish scenario of the eveningstar pattern plays out in the gaming stocks, it would imply weakness in NVIDIA. Likewise, if NVIDIA shares are able to recapture their 50 day moving average and continue higher, the gaming stocks would be expected to return to their primary uptrend.